The Transport Bar widget within the SoundBridge: DAW lets you control the main aspects of your project, as well as how you interact with it. In Part 1 of the Transport Bar tutorial, we’ll cover File & Edit menus, Timecode, CPU & Output meters, as well as a segment which includes Record, Play/Stop, Shift, Delete, and Punch In/Out. Lastly, we will cover the Swing feature. The first thing to notice is the SoundBridge logo which is located in the bottom left part of the window. It toggles the full-screen function. Next to the SoundBridge logo is the “Help” display box. This help menu will display the name, shortcut, and function of all SoundBridge parameters you hover your mouse pointer over. Abovementioned, there is a section dedicated to the “Menu” buttons. The first button of this group is the “File” button which lets you create a new project or open an existing one. Here you can also save the project that’s currently open or save it under a different name. In addition, you can import audio or MIDI files. By clicking on the “Freeze Track(s)” you can freeze the track that puts a strain on your CPU by rendering than to a new audio track, audio file on your hard drive or have them rendered in place. Since this feature offers a great number of options we will cover it in full in one of the next tutorials. Besides that, you can export MIDI clips as MIDI files on your hard drive and audio from your project contained within the loop boundaries. Below, you can find an exit feature which is used to exit SoundBridge when your creative process is done or open another project from the recent projects list. Moving on the right from the “File” button we can see the “Edit” button. This feature offers the primary editing function and more. After the standard “Undo & Redo” functions for the last actions in your project, you have your “Cut, Copy and Paste” functions. All of them will work on tracks, mixer channels, plugins, MIDI mapping, audio, MIDI and automation blocks, MIDI notes and automation ports. Paste to the selected track will paste the content copied from a different track on the currently selected track. Here you can also rename, delete or duplicate the elements of your project, as well as select all of the same kinds of elements. Next, the “Group Tracks” lets you group tracks together. This means that the audio routing of these tracks will be available on the new channel strip so that they can be processed together. The “Split” function allows you to split all the elements under the playhead in the project. The “Merge” function will join two or more of the selected elements of the track into single block object. This function is good for the arrangement and keeping your project neat and organized. The “Adjust Length” function rounds the duration of the selected MIDI notes to the nearest increment determined by the beat selector to the right of the so-called “Snap” function. The “Quantize” rounds the position of the selected MIDI notes and automation points to the nearest increment determined by the beat selector. The last three functions from this menu are “Auto Quantize Notes”, “Auto Preview” and “Automation Follow”. The “Auto Quantize Notes” rounds up the position of the incoming MIDI notes to the 1/16th note grid automatically. “Auto Preview” lets you hear each audio sample while you go thru them in the file browser. Lastly, the “Automation Follow” function will make your automated X/Y coordinates, knobs, faders, and buttons as well as you built in effect, physically respond to changes made with the automation during playback. The last button which can be found in line with “File” and “Edit” buttons is the “Preferences”. The next section within the transport bar is the “Time Code” monitor, “CPU Meter” and the “Master Output Level Meter”. All 3 have an informational character where you can see the time code at the playhead, real-time CPU usage which can be helpful to determine if you need to freeze the track or two. Lastly, your master output level comes in handy to monitor possible peaks. The essential executive buttons of the SoundBridge: DAW are the next three buttons: Record. Play and Stop. They are doing precisely what their name implies. Below them, you can find the following three buttons. “Shift” lets you select multiple items and “Delete” which deletes selected elements. This feature comes in quite handy if you are using SoundBridge: DAW on a touchscreen device. On the left, we can see two buttons which are offering “Punch In” and “Punch Out” functions. Gloves represent them. These functions are used for recording. Necessarily, when you engage them, your recording will limit just the part which you have previously selected by the loop marker in the arrangement window of the SoundBridge: DAW. Punch In, when activated, starts the recording on the armed track at the beginning of the loop which you have previously selected by using the loop marker, independently from the playhead cursor. Punch Out stops the recording on the point where loop end marker is set. Moving forward, we can see the “Swing” button. 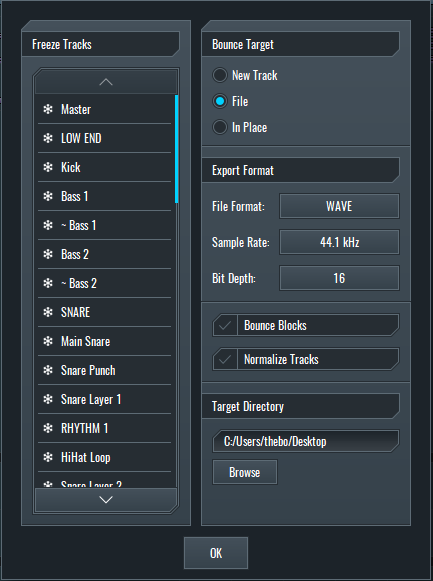 It opens a new dialogue where you can create a swing quantization setting that will be added to your beat selector. It is possible to choose between 1/8, 1/16 or 1/32 note division and dial in your desired amount of swing expressed in percentage. 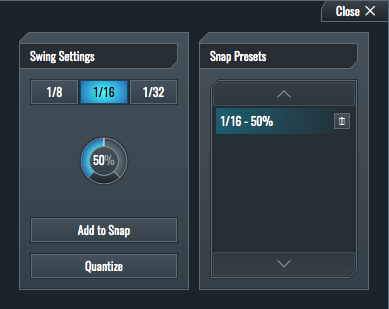 By clicking “Add to Snap”, you’ll add the current setting to the snap and beat selector. “Quantize” will quantize all the currently selected events in the project to the setting you just made.